The name Washington Roebling seldom crosses the minds of those who cross the Brooklyn Bridge. Wagner frames the Chief Engineer's monumental accomplishment within the context of horrid abuse by his brilliant, tyrannical father, four years of battle in the Civil War, and his own unfailing intelligence, integrity, and often sardonic wit. 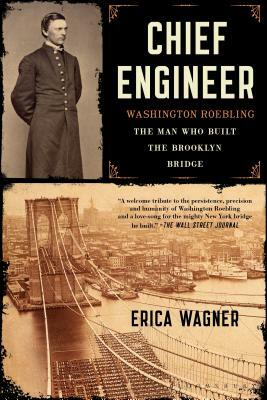 Chief Engineer is the first full biography of a crucial figure in the American story--Washington Roebling, builder of the Brooklyn Bridge. One of America's most iconic and recognizable structures, the Brooklyn Bridge is as much a part of New York as the Statue of Liberty or the Empire State Building. Yet its distinguished builder is too often forgotten--and his life is of interest far beyond his chosen field. It is the story of immigrants, the frontier, the Civil War, the making of the modern world, and a man whose life modeled courage in the face of extreme adversity. Chief Engineer is enriched by Roebling's own eloquent voice, unveiled in his recently discovered memoir, previously thought lost to history. The memoir reveals that his father, John-a renowned engineer who came to America after humble beginnings in Germany-was a tyrannical presence in Roebling's life. It also documents Roebling's time as a young man in the Union Army, where he built bridges to carry soldiers across rivers and fought in pivotal battles from Antietam to Gettysburg. He then married the remarkable Emily Warren Roebling, who played a crucial role in the construction of the Brooklyn Bridge, Roebling's grandest achievement-but by no means the only one. Elegantly written with a compelling narrative sweep, Chief Engineer introduces Washington Roebling and his era to a new generation of readers. American writer and critic Erica Wagner was the literary editor of the London Times for seventeen years and is now a contributing writer for New Statesman and consulting literary editor for Harper's Bazaar. Her work has appeared in the Guardian, the Economist, Financial Times, and the New York Times, among others. She is the author of Ariel's Gift, Seizure, and the short story collection Gravity. She lives in London with her husband, the writer Francis Gilbert, and their son, Theodore. “A masterful psychological study about duty and drive.” —The Economist, "Books of the Year 2017"
“A masterful work of research, revelation and gripping narrative. It brings to pulsating life 19th-century New York and New Jersey and manages to be moving, too.” —New Statesman, "Books of the Year"